So, this will be one of those paintjobs I will abandon. I never finish around 60-70% of miniatures I started working on. Most of the times I either restart the work by washing of the paint, or just leave it on the shelf looking sad. I know that there is a rather big number of painters, that believe this is a big and common mistake – as correcting mistakes is an integral part of learning. They are probably right. Yesterday, after few days I started applying battle damage to do whole area I painted – at that point I wanted to check If I can save the work I already done. The battle damage, scratches, dots really didn’t work well. Moreover, the earlier mistakes from the shading / highlighting don’t help either. I made several mistakes, both with the style, colours I used and transitions. Let’s get over them – as I strongly believe that this helps in development both for me, and hopefully for you too. Sol Yellow from Scale 75 proved to be a nice paint – it is intense in saturation and brightness, but after adding Mars Orange it really shines. I did try to correct it with a glaze of Lich Purple, the effect was still not good enough. Not sure how the highlights should go. Adding white didn’t provide the effect I was aiming for. Perhaps, this was due to the fact for highlights I kept adding Sol Yellow. I am happy from the base mix of Sol and Mars Orange. It is warm, it is intense and highly saturated. Moreover, it is easy to apply and has a consistent coverage (you need two-three layers for a smooth coverage). Sadly, this is not old GW Golden Yellow. The bad is both highlights and shades. Moreover, I just hadn’t taken into consideration light distribution. Although this was done on purpose – the first idea I had for this miniature was to paint in a simple, more eavy metal style. One more thing – I need to get my hands-on Flash Gitz and try it out, as I heard some nice things about it. 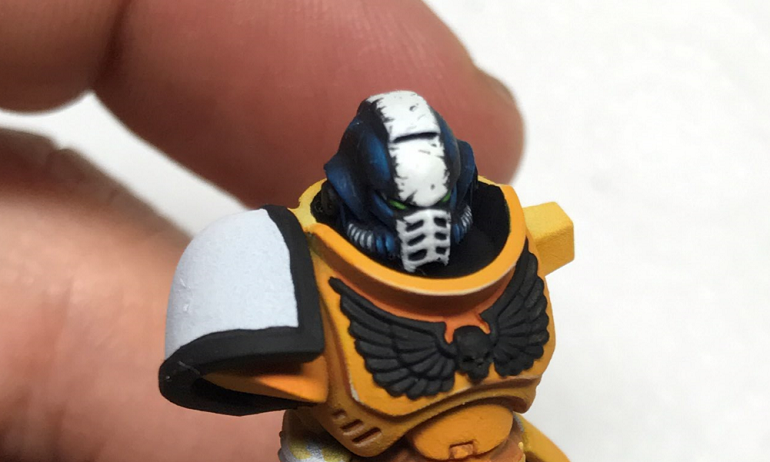 When painting Black armor on Cypher, I used only grey as a mid-colour. Here I switched to using Caspian Blue from (again) Scale75. Which provided quite nice effect! The idea is simple to start from Black the highlight with Caspian Blue then Valleyo Blue Grey finished with white. I think this marvellous job Max Faleij Iron Fists Primaris Marine has a very similar concept. Will try this out on a different miniature – perhaps on an Eldar Seer? The helm and the free hands work well. 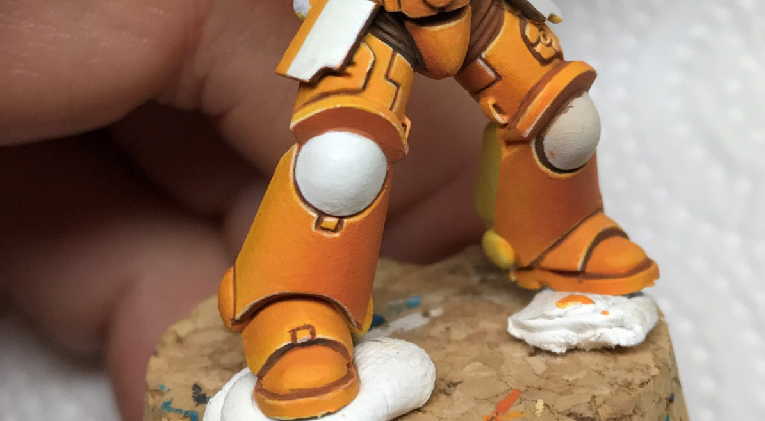 I really like the effect on the red knee guard (altough it needs some small corrects). It literally took 10 mins to paint. Waiting for the white paint to dry to achieve the smooth surface took more time than the red strip itself. The biggest mistake on the helm was that there shouldn’t be a black line separating the white strip and the blueish highlights. Should be easy to address in the future. The scratches are on the yellow armor on the other hand should be done differently. I actually used three different colours for those – light yellow, dark brown and black. For bigger ones I focused on adding white on the lower part of the scratch to simulate the light reflection. Those didn’t work well – I think I simply added to many of those, moreover they should be more chaotic. Lastly, the smaller patches were done by using a sponge, that I dipped in black paint and then gently applied on the model. I will need to work on this elements, as I really want to add more texture to the miniatures I paint. As for now, my plan is to go through old painting budha video’s and check Ben Komments patreon page – as the last model he painted was heavy in scratches, marks, and general heavy usage look.